Ascension Thursday: Where is the Cantor? Should we sing the prayer before meals? Can Polyphony work with 140 singers? Who is this Rheinberger guy anyway? Catholic Music: Hope or Despair? What is the ideal in Liturgical Music? With the Pope's visit to the USA now concluded it seems like a good time to review and reflect upon what has gone on liturgically. Let's consider a few different aspects in comparison between Washington and New York. The arrangement at Washington provided the best liturgical backdrop, taking cues found in proper church architecture. 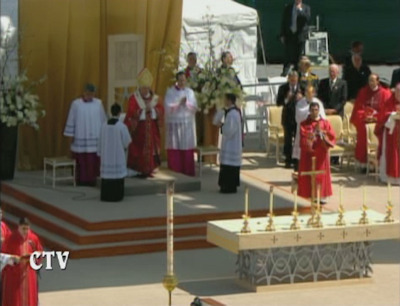 Washington here as well gets the nod by bringing the fullness of the "Benedictine arrangement" to bear with the altar candles directly upon the altar with the central altar cross. The New York arrangement does at least have the central altar cross upon the altar and in the second case, also the 7th candle, but the Washington arrangement is more consonant with what Benedict and Marini have been trying to establish and it more effectively delivers the necessary teaching about orientation within the liturgy. Yet again would I give Washington the nod on this front. 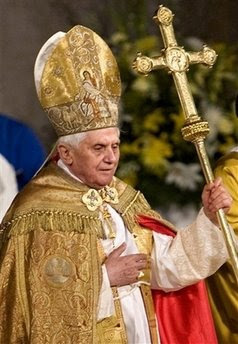 Aside from better representing the liturgical tradition and representing the Roman practice of Benedict, they also are of a better overall quality and beauty, thereby lending themselves well to the dignity of the sacred rites. I will let our NLM music people speak more in-depth about this matter, but it needs a cursory review for our purposes. 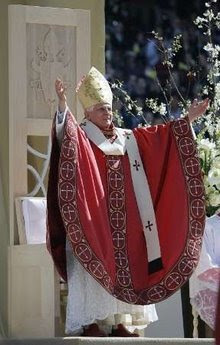 New York: Both of New York's two liturgies were defined by their regular use of chant, polyphony and other classic forms of liturgical music which have been spoken of by the Church and the Popes, including the present pontiff. Washington: The Vespers service in Washington was quite well done and included a number of polyphonic elements which were quite edifying. 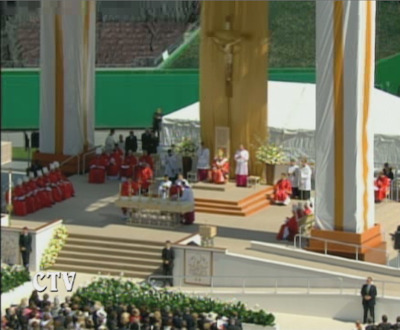 The Mass held in the stadium was, however, much different in overall tone. Here, an overall consideration would give New York the nod, with an important recognition going to the Vespers in Washington. The breakdown that we see here is that Washington comparatively excelled on the scale of those elements which are more visual in relation to the liturgy (altar arrangement, stadium sanctuary design, vestments) while New York excelled in the area of sacred music. 1. Three of the four liturgies were characterized by traditional forms of sacred music. Beyond that, we also saw the sung Gospel, the use of the Graduale and more polyphony and chant than has likely been heard at most any papal Mass outside of Rome in recent memory. This is significant. 2. As part of that, this also means that there was significantly more Latin (and Greek) at these liturgies than has also been heard in similar papal Masses in recent memory. 3. 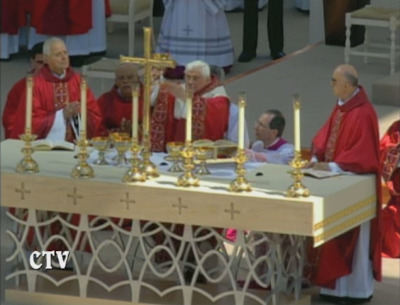 Two of the four liturgies had the complete "Benedictine altar arrangement"; and while the other two were a compromised version of it, at very least they had the central altar cross meaning it was at least present in some form -- a reference that couldn't fail to be noticed. The Benedictine arrangement is, by consequence, much more in the consciousness of priests and laity in the United States because of it. 4. Other elements could also be mentioned, such as the predominant use of the Roman Canon, the beautiful cope for Vespers and so on. If one takes into consideration these international papal liturgies with what we have typically seen in recent years and decades (including so recently as World Youth Day in Germany, or the Papal visit to Austria), there is quite a bit here, and while all the elements didn't simultaneously come together as they presently do in Rome, the elements were there at very least. Beyond that, while it is important for these elements to come together, they are also each important in their own right and so their very visible and audible presence cannot but be a good thing.